Alexandra Winters received her Bachelors in University Studies and Masters of Science in Occupational Therapy, both from the University of Mary. 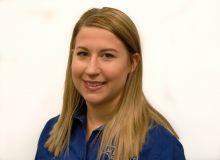 Alexandra has experience in adult acute care, with the pediatric population and in adult rehab. Alexandra has worked with children of all ages, from birth through adolescents, for over six years. Her areas of interest include infant & childhood development, sensory integration, feeding therapy, and neurological conditions. She is CPR and AED certified.